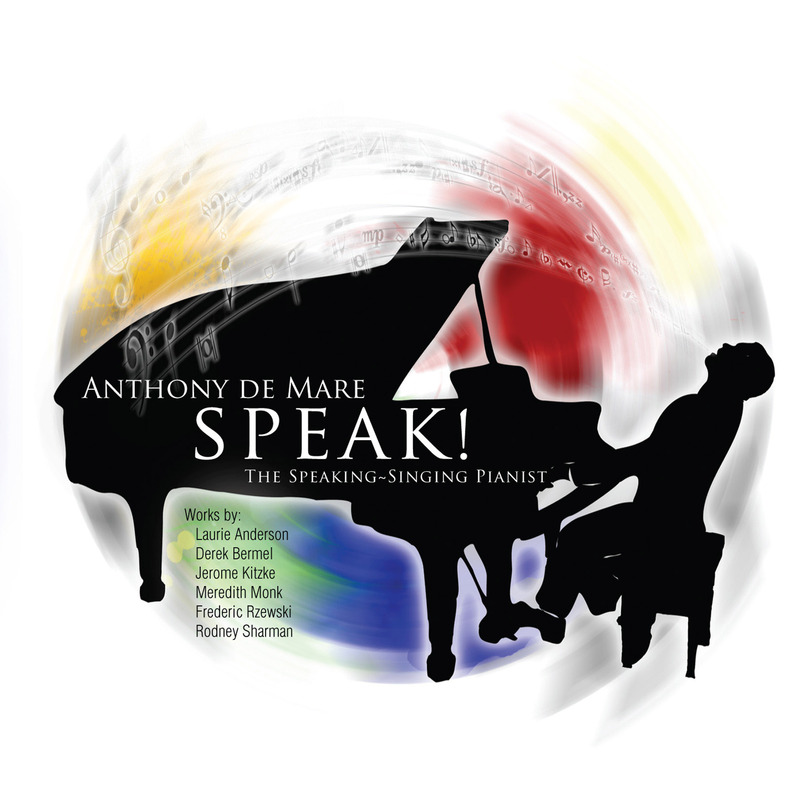 Surprisingly, even though a good two-dozen speaking/singing piano works have been written for ANTHONY de MARE, his newest recording SPEAK! – The Speaking-Singing Pianist is the first CD entirely devoted to the speaking/singing pianist genre that he pioneered over 20 years ago. Speak! contains three pieces written expressly for him: the extraordinary masterworks De Profundis (1992) by Frederic Rzewski and Sunflower Sutra (1999) by Jerome Kitzke, and Rodney Sharman's extremely intimate, revelatory setting of Peter Eliot Weiss' The Garden (2001). De Mare transcribed Meredith Monk’s urban march (shadow) (2001), and joined forces with David D. McIntire to transcribe Laurie Anderson’s Statue of Liberty (2001). And he puts such a personal stamp on Derek Bermel’s touching setting of Will Eno’s Fetch that it becomes his own. All of these pieces are premiere recordings with the exception of De Profundis, which is his second commercial recording of the work, having performed it hundreds of times over the past 15 years. De Mare's speaking/singing pianism and championship of American composers has its roots in his love for the American musical theater, thanks to his early dance training, choreographing musicals, and acting, dancing & singing his way through numerous shows in high school, college, and summer stock. However, it was his association with teacher and mentor Yvar Mikhashoff who led him to investigate Meredith Monk’s work, coaching and working with her and her company in the mid-eighties, Subsequently, he found himself adapting and arranging several of her vocal/ensemble works for solo performance. Around this time, Frederic Rzewski attended a performance he gave in Belgium of speaking/singing works by Monk, Cage and Rzewski’s own controversial text-based work Lost and Found. He was so impressed by de Mare’s performance, it confirmed his desire to write the first extended text-based work for him based upon Oscar Wilde’s final letter which he had been envisioning as an oratorio for solo speaking pianist. What fascinated Tony about the piece was the challenge for the performer to allow the piano and body to be extensions of one another, to become one instrument. Seven years later, Jerome Kitzke followed with Sunflower Sutra, a setting of Allan Ginsberg's powerful poem from his "Howl" collection. That is the essence of de Mare's genius as a speaking/singing pianist. As he performs music that speaks of love, doubt, and self-acceptance, he addresses and nurtures the shared heart that binds us together in the most difficult of times. ANTHONY de MARE’s dazzling virtuosity and originality have helped establish him as a true champion of contemporary music. He has inspired and premiered the creation of new work by composers of all generations and styles and has commissioned and collaborated with many of the world’s most esteemed musical artists. Praised for his "muscularly virtuosic, remarkably uninhibited performance [and] impressive talents" (The New York Times), his performances continue to draw praise from leading music critics for breathing new life into the recital format. His performances span five continents, allowing him to develop a growing fan base internationally that extends far beyond the traditional contemporary music audience. Having been awarded First Prize and Audience Prize at the International Gaudeamus Interpreters Competition (The Netherlands) and The International Competition of Contemporary Piano Music (France), de Mare debuted under the auspices of Young Concert Artists and gave his Carnegie Hall debut at Zankel Hall. Anthony De Mare, pianist, vocalist, dramatist, story-teller, is one-in-a-million. He realizes works that call upon his considerable talents to enact compositional dramas in a quasi-sprechstimme way. He narrates, sings, recites, provides vocal-sound elements and accompanies himself on the piano, all at the same time. You can hear it to good advantage on his definitive album Speak! The Singing-Speaking Pianist (Innova 241). These are performance pieces composed by the likes of Laurie Anderson, Meredith Monk, Frederic Rzewski, and three others. The coordination and masterful execution of vocalise, singing, exclamatory assertion and pianistic punctuation is nothing short of extraordinary. This fellow is very good! The pieces have enough in the way of music, story and pacing that time goes by quite quickly. And it is time spent to good use. In a way, this is the thinking person's Broadway, the hipster's alternative to opera, the musical equivalent of a very dynamic poetry reading, theater for those jaded with the usual claptrap. It's a trip that you will very much enjoy if you have an open mind.